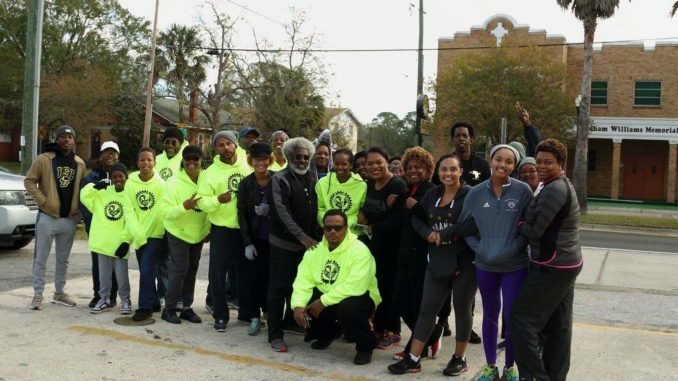 This past weekend concerned citizens and activist joined the Kemitic Empire for an inaugural “Awareness Walk” at the corner of 16th and Myrtle Avenue. Local residents, city and state official sparticipated in the walk to bring awareness to African American health disparities in the urban core neighborhoods. Fitness expert and trainer Melinda Henry led participants in a series of pre-walk exercises to warm up the crowd for a healthy 2K walk. Health screeners and nutritionists were also available to provide vital information to help manage health conditions, due to medicine intake, or simply to help maintain a healthy weight. Shown are walkers warming up in the morning sunshine.